Errol: I’m not a perfectionist, not by a long shot. However, I was really concerned about Jen’s bow being in the right place. Manpans, who wrote the NaNoMusical with me, thinks I’m weird. She thinks I become obsessive about the weirdest things. Just to let you know, I’m not manning the site for the next few days. I’m at Orycon, and I don’t think I will have an internet connection. The comics, however, will continue. So don’t you worry. Maybe Rob and Dave finally got around to getting new computers- and isn’t NaNo the perfect opportunity to put them through their paces? It’s true. You are weird. Of course you’re weird. 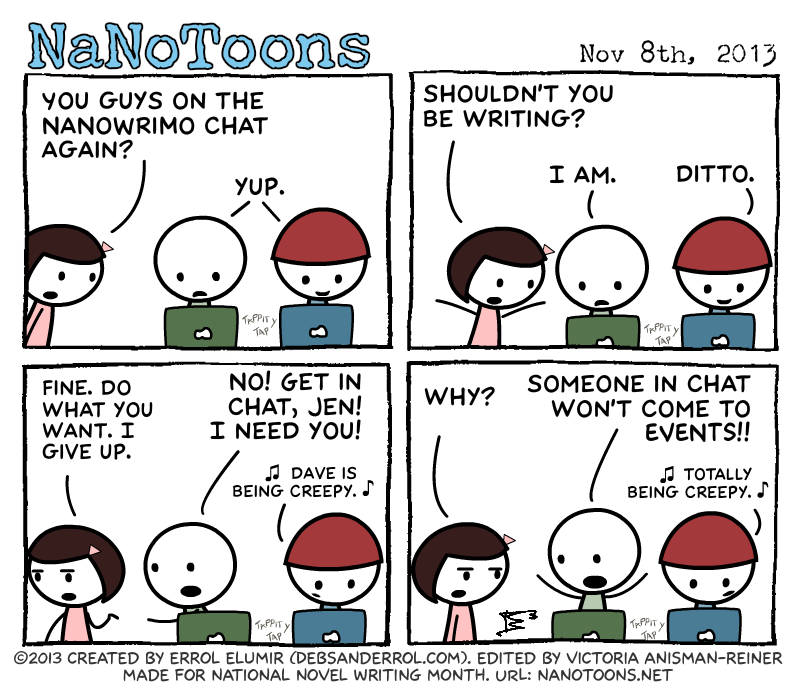 You participate in NaNoWriMo. By default, you can’t possibly be normal or sane. And yes, maybe Rob and Dave got new computers. Or maybe they just got those snazzy laptop cover things you can get with all those designs and different colors and so forth. Or maybe they’re borrowing laptops from somebody else because theirs are drying out from a nasty coffee spill. The loopholes are endless! However, there are not so many loopholes to allow for Jen’s bow to randomly switch sides from one frame to the next just because she turned her head, so I totally understand and appreciate being a bit obsessive about that.